I've just finished reading this article from Newsweek about Oprah Winfrey and the 'medical' advice so often featured on her show. They really get stuck in, covering everything from her endorsements of Jenny McCarthy (don't immunise your children) and Suzanne Somers (inject hormones to make you feel better) to her rapturous glorification of The Secret. I don't really like or dislike Oprah. I have watched her show from time to time, but since I work full-time and have done since I left school pretty much, I don't see it often. Sometimes what I have seen has been interesting and other times I don't even bother watching to the end coz I think whatever she's discussing is crap. 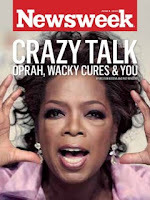 I found this article interesting because it doesn't take the view that so many do, that Oprah is a saviour and a deity. There are thousands of women who watch Oprah every day, buy her magazine and books, and listen to her radio network. With that many women tuning in there is sure to be a wide ranging demographic of people who follow Oprah. I'm sure many of the people who watch Oprah are more than capable of making decisions for themselves and of being able to think critically about what Oprah is presenting to them, but I know there is a small sub-section of people who for some reason or another don't think critically. They take everything they hear from Oprah, and others like her as truth and those are the people at risk of being made 'sick' by Oprah and her guests. "For 23 years, my show has presented thousands of topics that reflect the human experience, including doctors’ medical advice and personal health stories that have prompted conversations between our audience members and their health care providers. I trust the viewers, and I know that they are smart and discerning enough to seek out medical opinions to determine what may be best for them." This may be true of a majority of her viewers but for a small minority it's not. These are the same people that listen to talkback radio and think that Joe Blow from Out of Nowhere knows exactly what he is talking about when he gives his opinions and that he has researched the topic he's called in about and is an expert to be given time on air. They therefore go back to their lives believing half-truths and being misinformed to the point of ignorance and will follw the advice of people such as Oprah to a T. Beacuse after all, if it's on the tv or in the news it must be true, right? While I don't think Oprah and people like her can be blamed for people's ignorance and stupidy I do think they need to recognize the HUGE influence they have in some people's lives and show a little more responsibility when it comes to presenting medical advice and information and not to skate over the negatives. I don't know, am I expecting to much? Should Oprah have to present a balanced view or can she do what she wants, regardless of whether or not people are following this advice without seeking the advice of a medical expert first? It's a musing worthy of more thought, but my brain is putty and tired so I can't do so tonight! I will. It's a good thought.